A decision to remove blue disabled badges from a community transport group has been described as "bonkers". Gordano Community Cars has had its blue badges cut from six to two and has been told by North Somerset Council to tell passengers to get their own badges. Carol Sexton, from the group, said: "We sometimes have eight drivers out. We can't function on two badges." The council said the decision was "based on the evidence of need" but it was "happy to review the situation". A council spokesperson said: "All applications are assessed on the evidence of needs presented in the application process. In this case this showed a need for two blue badges. This is not a cost-cutting exercise." 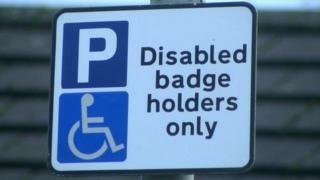 The council said that a blue badge should only ever be used "when a disabled person is travelling in the vehicle". The spokesperson added that the national criteria for blue badges "does not include old age, general frailty, ill health or convenience". The voluntary hospital car service, which has been running for 15 years, provides transport to local hospitals and medical centres. But in a letter to the group, the council said blue badges were only issued to organisations transporting those who "meet the criteria for a Blue Badge" and the group transports "all patients". The authority said the passengers who use the service can apply for personal blue badges instead. But Ms Sexton said it has 27 volunteer drivers carrying out hundreds of trips a year and having just two blue badges was "absolutely bonkers". "Our patients are getting older, often live alone and are frail. They depend on us, we're their lifeline," she said. "We've always been run by volunteers who have given their time freely and all we're asking for is for six badges to do our work." In a statement, North Somerset Council said it recognised the "valuable service" community transport groups provide. "Based on the evidence of need Gordano Community Cars provided in their application form, we agreed to issue them with two blue badges," it said. "However, if they provide further evidence in support of a greater need, we will be happy to review the situation."